Abdelhadi Majdalawi likes to chat about politics and his past. He recalls time spent in prison during the first Intifada, working in Israel, and the languages he used to know and has forgotten: English and Hebrew. “I was supposed to marry this Scottish woman who also worked in Israel”, he recalls. “I know that story very well”, his wife Atef smiles, but cuts him off before he starts recounting another old tale. That is how this family is: patient, open and affectionate towards each other. Abdelhadi Majdalawi likes to chat about politics and his past. The Majdalawis have always enjoyed a good conversation, smiled at their memories and been kind to one another. Since the Israeli offensive last summer, however, much has changed in their lives. 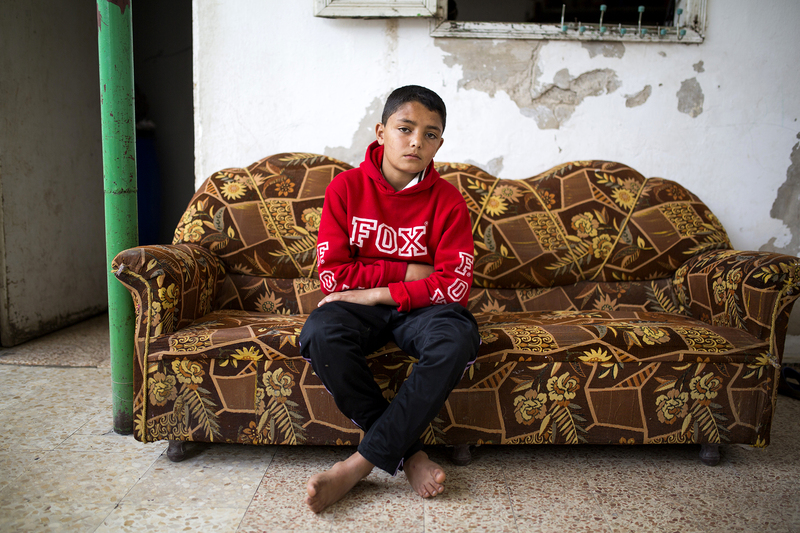 “We had such a beautiful, solid three-story home”, Abdelhadi continues, sitting in the patio of a rented house, roofed with a thin sheet of plastic that provides shade but not much protection from the summer heat. He says this heat wave is a result of what Israelis dropped on the Strip during the offensive codenamed Operation Protective Edge. Of course, he does not have a rational explanation for this claim. 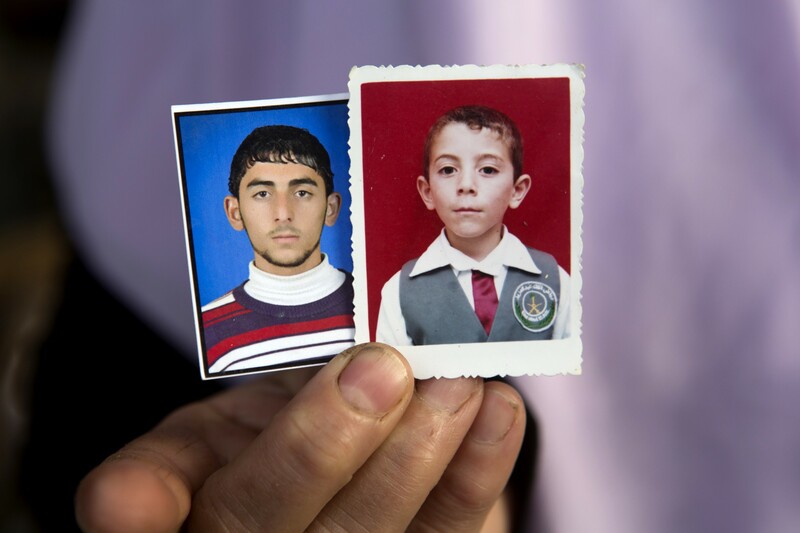 But there is a personal logic in it: for the Majdalawi family and many other Palestinians, the attack changed everything around them in a profound and often irreversible manner. Their world was altered forever: why would the weather be immune? 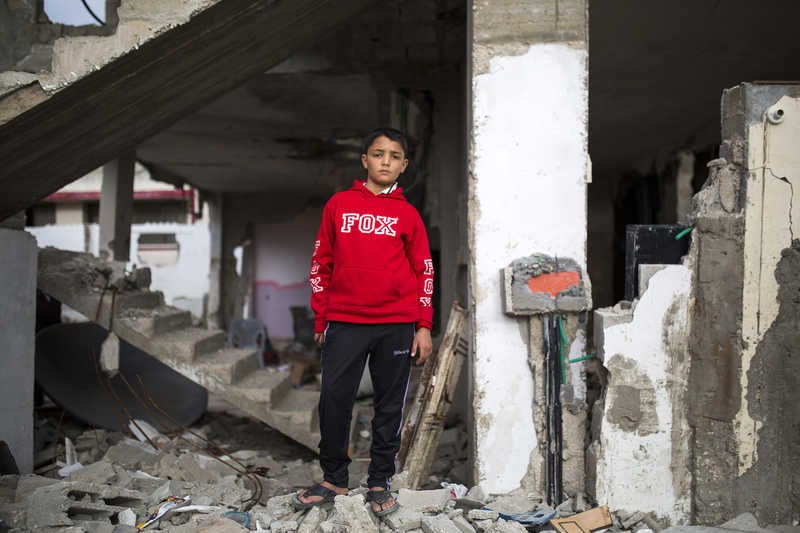 Abdelhadi standing in the rubble of Majdalawi's bombed house. “We had such a beautiful, solid three-story home”, he says. Talal's brothers: 13-year old Abdallah, and 19-year old Abdelrazeq. Their son Talal plays a football game on the computer. He does not lift his eyes from the screen. If he did, his absent gaze would fall on the portraits of his dead brothers: his twin, 13-year old Abdallah, and 19-year old Abdel Razeq. It is hard to tell if he is actually enjoying the game, the boy hardly ever smiles. Nights are the worst. Talal cannot fall asleep. His head hurts. Nightmares come back. The 13-year old waits until dawn and at 4am he leaves the house and goes to swim at the nearby beach with a few of his friends. He used to do it with Abdallah. 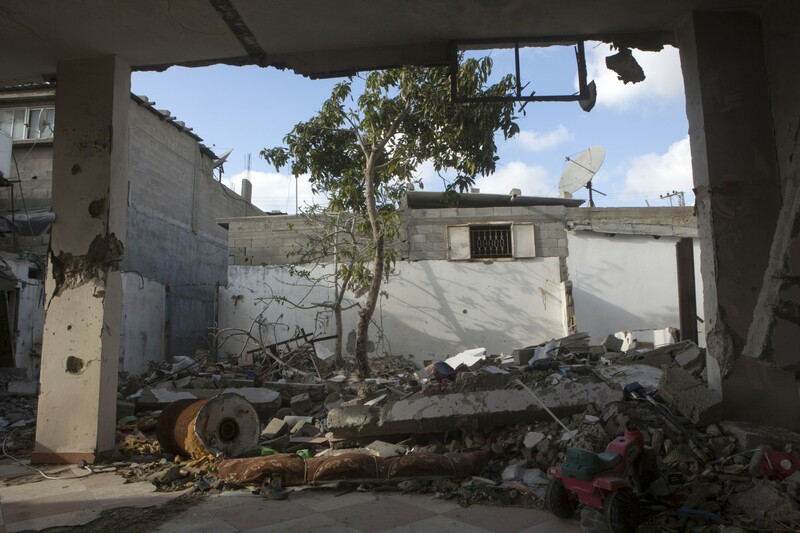 But last year, an Israeli pilot dropped a missile on his family’s house. Talal was in front of the house: he saw it coming. Instead of running away, he rushed inside to warn his brothers. There was not enough time. His two brothers, little cousin and niece were killed. Talal’s head was cracked open. 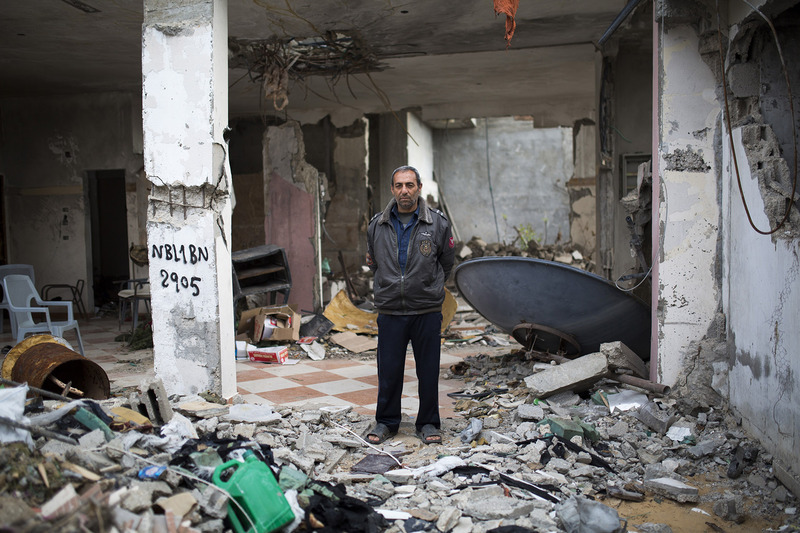 Talal in the ruins of his destroyed home. 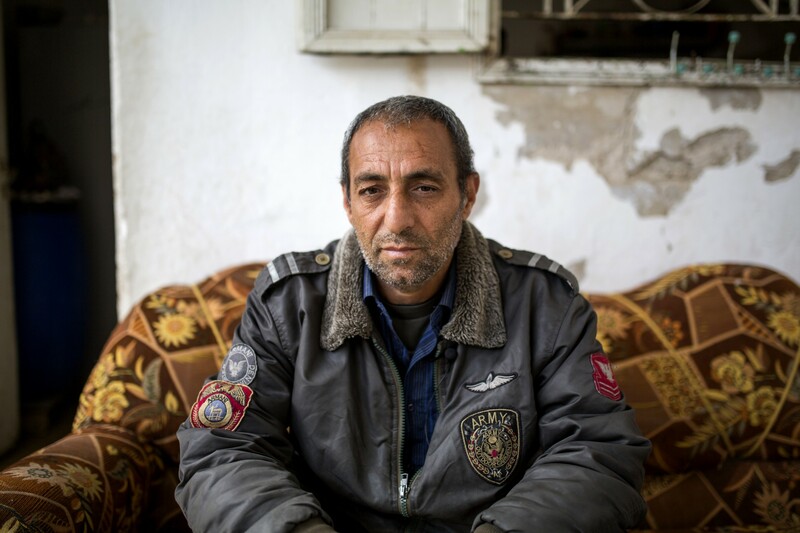 He currently lives with the other survivors in a rented home, a few dozens meters away. Talal does not talk much. Most of the time, his face is still, marked by a serious, deeply saddened expression. He cheers up a little bit when the conversation turns to football. “But he cannot play football as he used to. He has to watch himself, because of the injury”, explains his friend Muhammed when they emerge from the warm sea, after an early morning swim. Abir is Talal’s older sister. 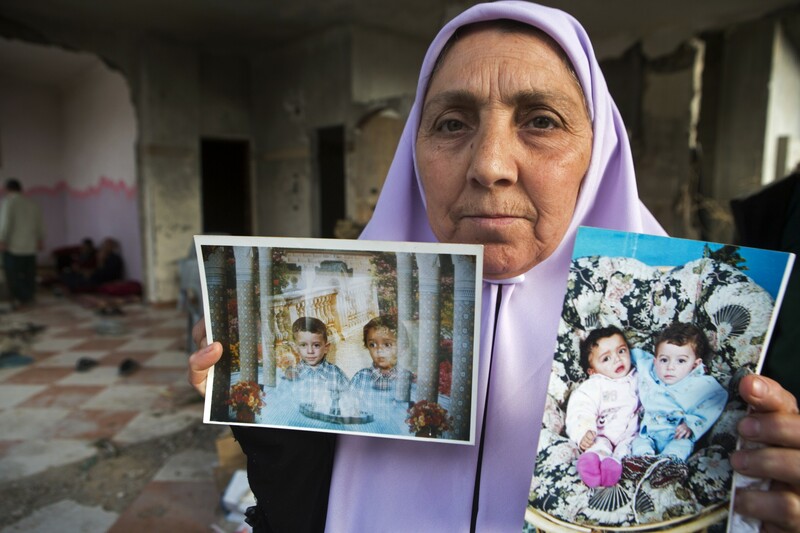 Her husband died 7 years ago, while digging a tunnel under Rafah, at the border between the Gaza Strip and Egypt. Those tunnels, now shut down by the Egyptian military regime, used to be a lifeline for Gazans and their stranded economy. After her husband’s death, Abir moved back into her parents’ house, so Talal grew up playing with Abir’s three kids, his nieces and nephews: Rawan, Yehiya and Ahmed. 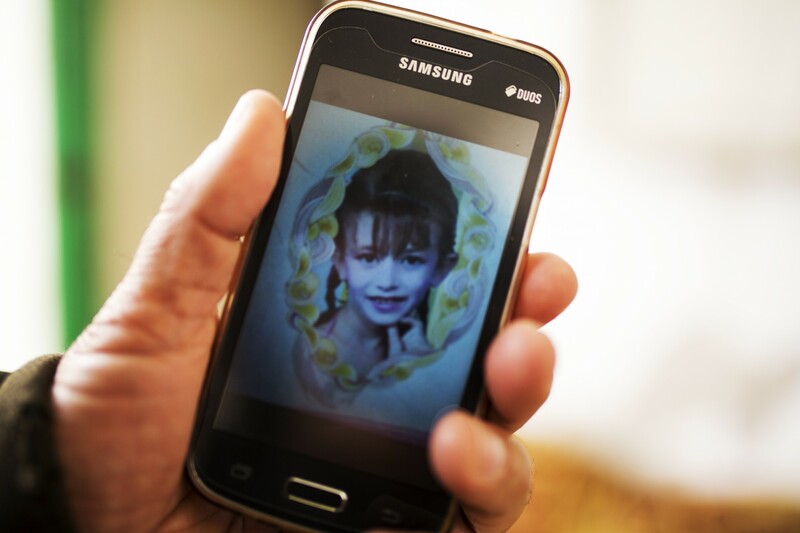 9-year-old Rawan was the oldest of the three siblings. She took care of her brothers and helped her mom, filling in for her missing father. Rawan took the boys to school, made sure their homework was done and brought the groceries home. Ahmed, now 5, climbs on his mother’s lap. Abir embraces him affectionately. “Rawan was aware of our situation; she understood that her father was dead and I needed her help. We spent a lot of time together”, she says. Hiyam is married to Abdelhadi’s brother, Ahmed. She breaks into tears when she starts talking about her only son, Mahmoud: “I waited nearly 20 years to have a child.” It took a fertility treatment for her to be able to get pregnant. She was very protective of her little boy: they spent a lot of time with each other, Hiyam sometimes being too worried to let him out of her sight. “We built sand castles, we played together”, she says, stressing that he was mature beyond his age and often preferred the company of adults over that of other kids. She takes out a photo album full of pictures of Mahmoud, herself and her husband – mementos of the happy family life they once had. 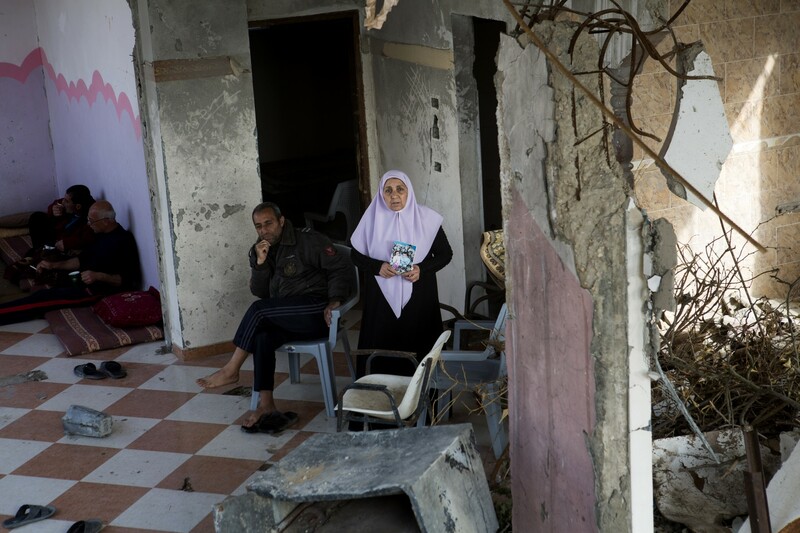 'Atef and her husband Abdelhadi amidts the ruins of their destroyed home. When they lost Abdallah and Abdel Razeq, four of Abdelhadi and ‘Ataf’s other children were seriously injured. Muhammed, 28, limps around the house. Most of the time he is quiet, but sometimes he bursts with anger at their unjustifiable loss. He himself had both of his legs broken; there is shrapnel in his body. “I was looking for a bride for Muhammed when the attack started. His future wife and him were supposed to move into one of the apartments in our house; it had been renovated for them. 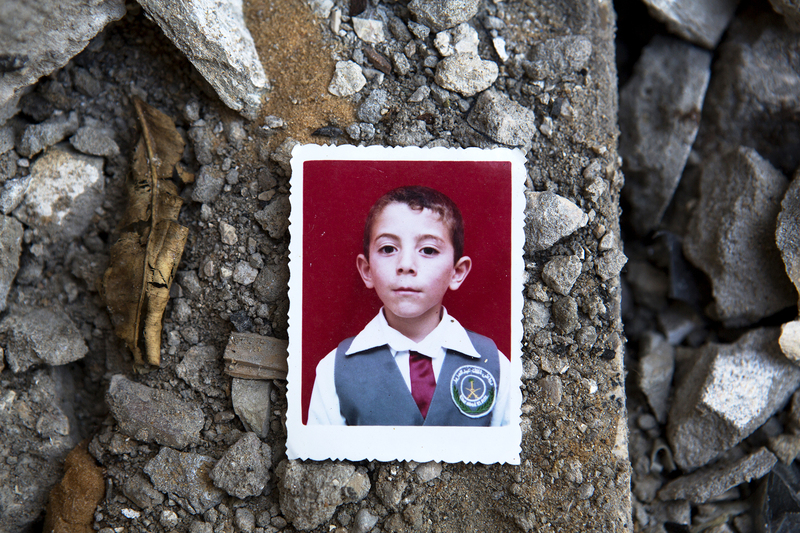 But instead, when we were hit, the roof of their future bedroom fell on his head”, cries ‘Ataf, Muhammed’s mother. 'Atef showing the photos of Talal and his killed twin brother Abdallah. 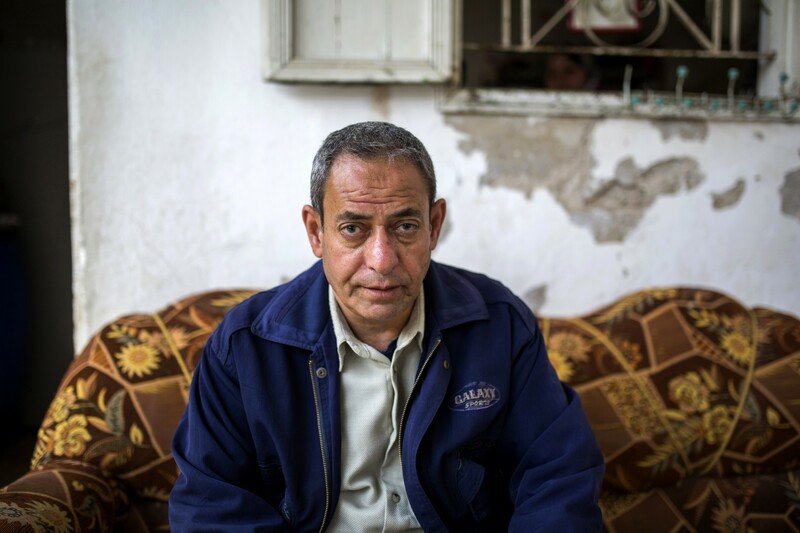 At the beginning, Abdelhadi used to go to the cemetery twice a day; now he visits the graves a few times a week. Just a day before our conversation, they held a commemoration for the four killed children. Family and friends came, drank coffee, ate dates, looked at photos and remembered the four lost lives. “We stick together as a family, but each other’s company doesn’t give us any joy. The house is filled with darkness”, Abdelhadi says. As the family struggles to make sense of what happened, the heat wave continues, unwavering, merciless. Mahmoud (8). “We built sand castles, we played together”, says his mother Hiyam, stressing that the boy was mature beyond his age and often preferred the company of adults over that of other kids. 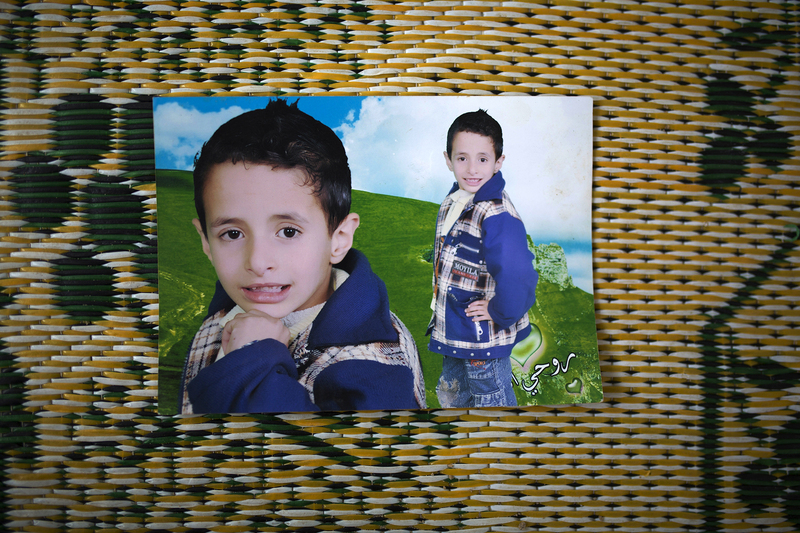 Abdallah (13), Talal's twin brother.